Choose a Bank of Ireland credit card today and avail of the great features and benefits below. It only takes a few minutes to apply online and you can be approved in 24 hours. 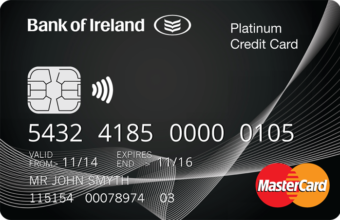 The everyday credit card with no annual fee. Apply for your Classic Mastercard online in minutes or call us on 0818 200 412 - Monday to Friday, 8am - 8pm. 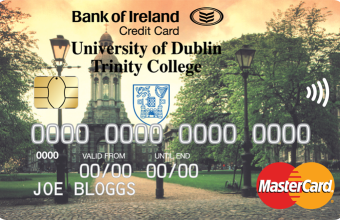 With our Affinity Credit Cards, you not only get all the advantages of a great credit card, Bank of Ireland also makes a donation to the college you choose and will donate a percentage of your annual expenditure at no expense to you. The Bank of Ireland Student Credit Card is specifically designed to suit your budget, lifestyle and financial needs. It is easy to apply for and subject to approval, gives you an immediate credit limit of €500 in your first or second year of full time study and up to €1,000 if you’re in third year or above of full time study. Over 18s only. Lending criteria, terms and conditions apply. Bank of Ireland is regulated by the Central Bank of Ireland. 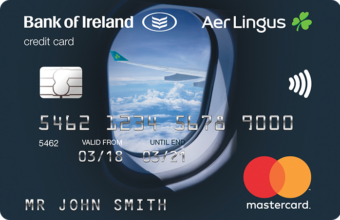 To access Aer Lingus operated lounges at Dublin, Cork, Shannon and Belfast Airports every Reward Year.